The velocity of money is in free-fall, and borrowing, squandering and printing trillions of dollars to prop up a diminishing-return Status Quo won't reverse that historic collapse. M1 includes funds that are readily accessible for spending. M1 consists of: (1) currency outside the U.S. Treasury, Federal Reserve Banks, and the vaults of depository institutions; (2) traveler's checks of nonbank issuers; (3) demand deposits; and (4) other checkable deposits (OCDs). Money Zero Maturity (MZM) is M2 less small-denomination time deposits plus institutional money funds. 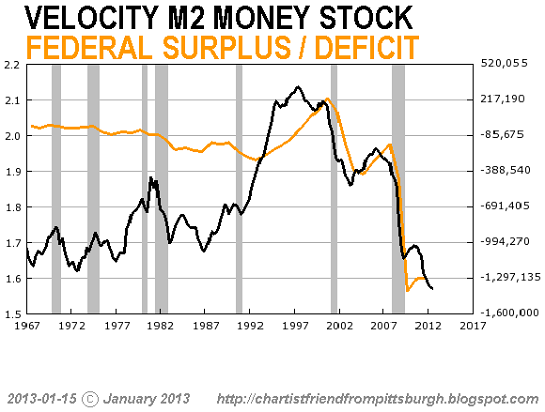 The correlation of deficit spending and money velocity is especially striking in the chart of M2 velocity. Since correlation implies causation, ideologically unbiased observers will wonder: does declining money velocity lead to more deficit spending, or does deficit spending depress money velocity? -- M1 velocity rose straight through the inflationary 1970s (no surprise there), chopped around the expansionary 1980s and then climbed along with the Bull market in stocks from 1994 to a peak in 2007, matching the peak in stocks and housing almost perfectly. -- M2 velocity first peaked during the height of inflation in 1981 (when interest rates also peaked), bottomed in 1987 and then tracked the stock market and economy higher, reaching a much higher peak in 1997, much earlier than M1 velocity. M2 fell substantially to a low in 2002 and then rebounded modestly to a lower peak in 2007, after which it collapsed. -- MZM velocity topped out in the inflationary surge of the early 1980s, like M2, but unlike the other measures, it did not ascend to new heights in the 1990s or 2000s; rather, it has fallen steadily for 30 years since its 1982 top. 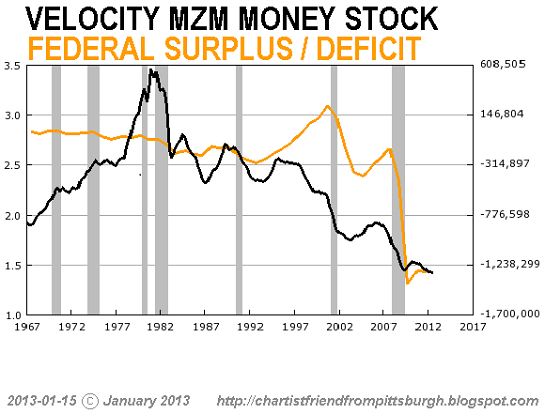 The most striking feature of these charts is the complete collapse of money velocity. MZM and M2 have collapsed to historic lows, while M1 has fallen back to 1982 levels. In this context, we can view unprecedented Federal deficit spending as a misguided attempt to compensate for the implosion of money velocity. I say "attempt" because the Treasury borrowing and blowing $6 trillion over the past five years and the Federal Reserve printing $2 trillion, backstopping the parasitic financial cartel with $16 trillion and buying over $1 trillion each of mortgage securities and Treasury bonds has only kept the economy stumbling along at essentially zero growth while real wages have declined by 7% to 9%. 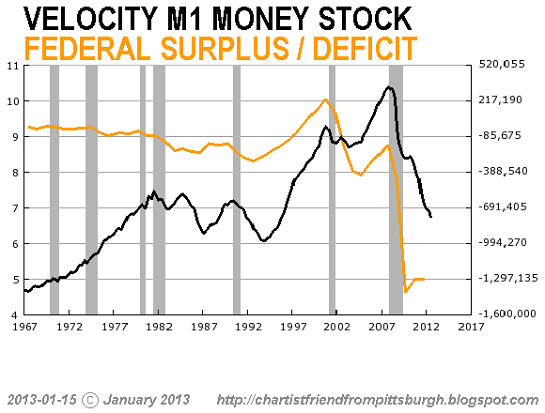 This stupendous creation of money and unprecedented fiscal stimulus has had zero effect on money velocity. This conclusively shows that fiscal and monetary stimulus are not fixing what's broken with money velocity. Keynesian stimulus policies (deficit spending and low-interest easy money) create speculative credit bubbles. As the above charts illustrate, post-bubble economies do not respond to additional stimulus because the economy is burdened by impaired debt and phantom collateral. In sum, the U.S. economy is a neofeudal debt-serf wasteland with few opportunities for organic (non-Central Planning) expansion. As a result, the velocity of money is in free-fall, and borrowing, squandering and printing trillions of dollars to prop up a diminishing-return Status Quo won't reverse that historic collapse. Put another way: we've run out of speculative credit bubbles to exploit. Thank you, Helen S.C. ($10), for yet another extremely generous contribution to this site -- I am greatly honored by your steadfast support and readership. Thank you, Barney S. ($5), for yet another extremely generous contribution to this site --I am greatly honored by your continuing support and readership.